Vintage clothes have the minutest details, especially the handmade dresses. Someone spent a lot of time putting this one together and then adding lace, two bows and a contrasting trim. 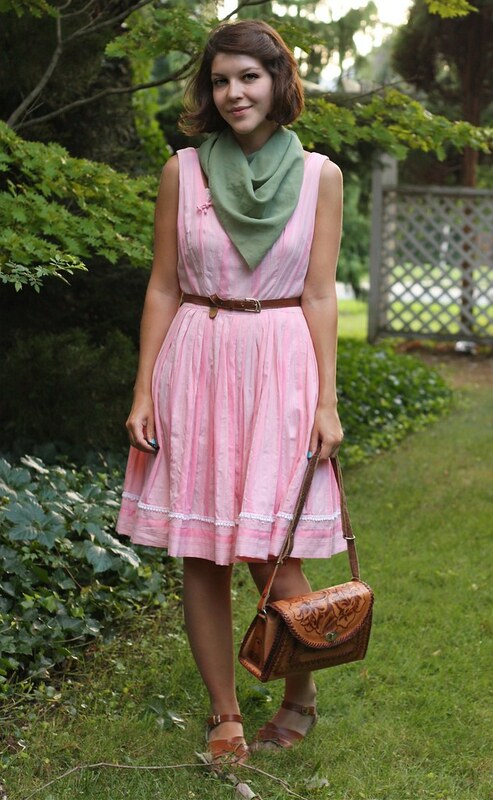 My stockpile (err, my mom's closet) is filled with vintage cotton dresses that are perfect for the heat, but none so simple and easy to wear as this one. I'm not sure if its still my style anymore, but summer can be exhausting and its very hard for me to be motivated to get dressed up or to focus on important tasks when the weather is hot. I am exactly as exhausted as I look in this picture, and I can't believe I'm still awake tapping away at the keyboard, ah well. that tooled bag is to die for! so beautiful. What a beautiful dress! You look so pretty! Such an beautiful dress, but you do look tired. Hope you feel better today! That dress is ssoooo pretty! I want to wear it to a tea party. also I am totally on the same boat with the tired thing... i can hardly keep my eyes open right now. it's rough. What a delightful dress. The epitome of femininity. And your last photo is too cute for words. ahhhhhhhhhhhhh perfection. you look soooo sweet! 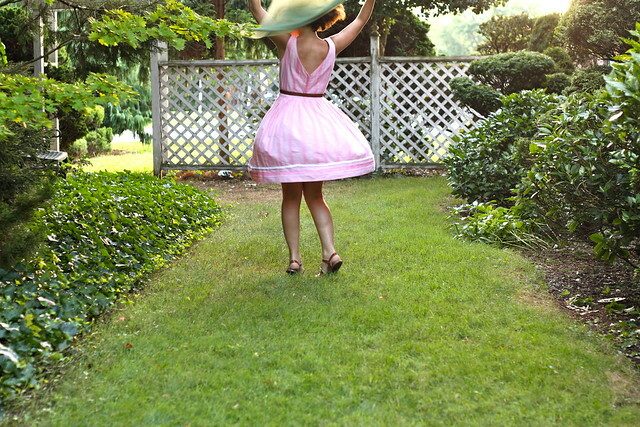 This dress is darling on you! You look absolutely perfect in that dress, so precious! I think you look adorable in that pink dress! The deep v in the back is awesome. So many cute details on it too. Perfect for looking cute in this hot weather! I adore this look! I wish my mum's wardrobe was full of cotton 1950s frocks. Ohhhh that last photo just makes my heart melt. So beautiful. awww i love your blog!! :) I was just in nyc two weeks ago and miss it so so much!!! :( i wanna go back so bad!! hope all is well! <3 have a great week!! !